The classic European dessert perfect for celebrations and festivities. This easy, veganised version is fun to make and won’t take you more than 20 mins to prep! 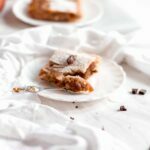 Ahh, a slice of vegan apple strudel. Us vegans tend to forget about the good ol’ local desserts that we’ve grown up with. 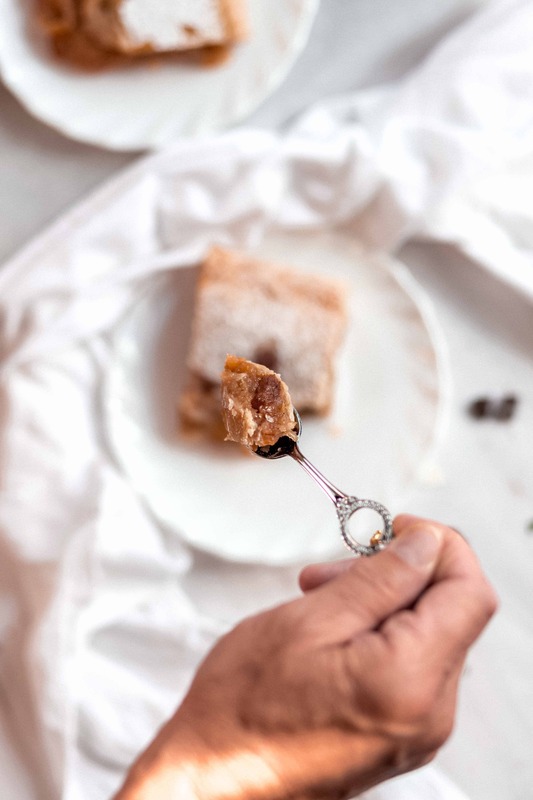 We’re so preoccupied with trying to make that perfect brownie, that ultimate chocolate fudge cake or those picture-perfect choc chip cookies that we forget how to make local vegan desserts that we all know and love. It dates all the way back to the 17th century! I’ve been lucky enough to grow up in a household that celebrated all forms of baking. Both my mum and my grandma would bake like there’s no tomorrow and no weekend would go by without hours of baking. 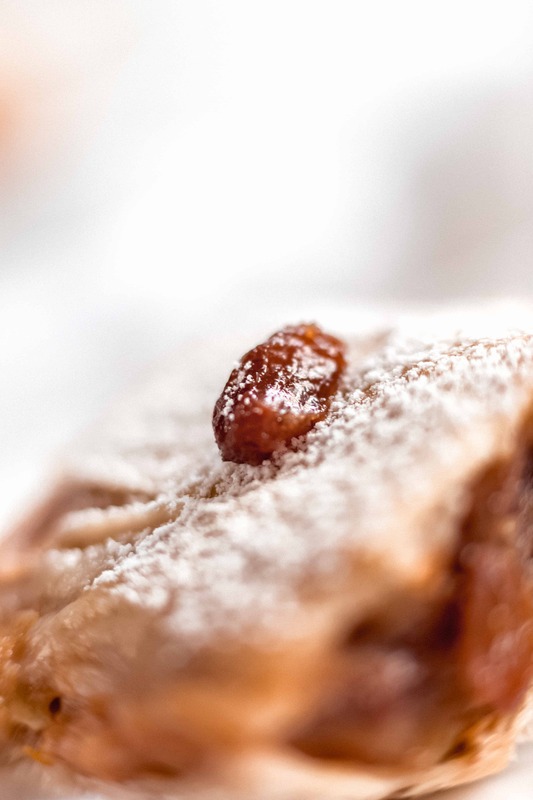 One of my family’s favourites has always been the apple strudel – a classic Viennese delicacy that’s at its best when served fresh out of the oven finished with a dusting of powdered sugar. 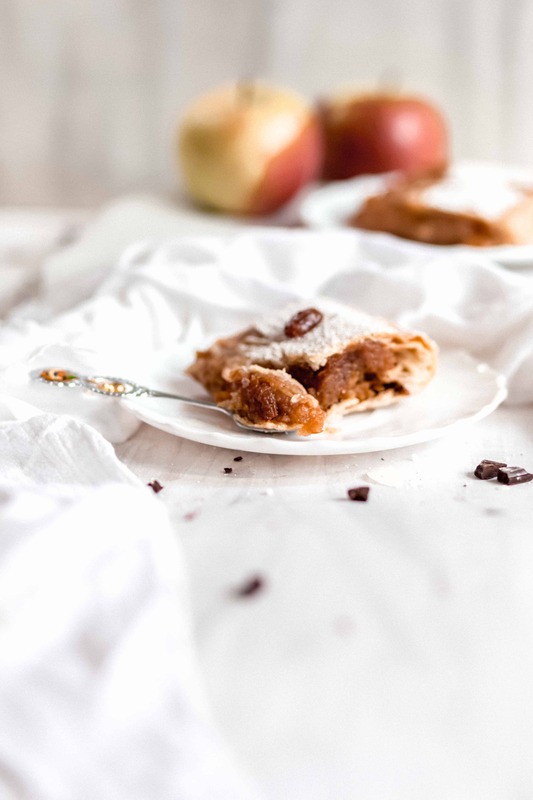 We all know that apples and cinnamon make the ultimate flavour combination. 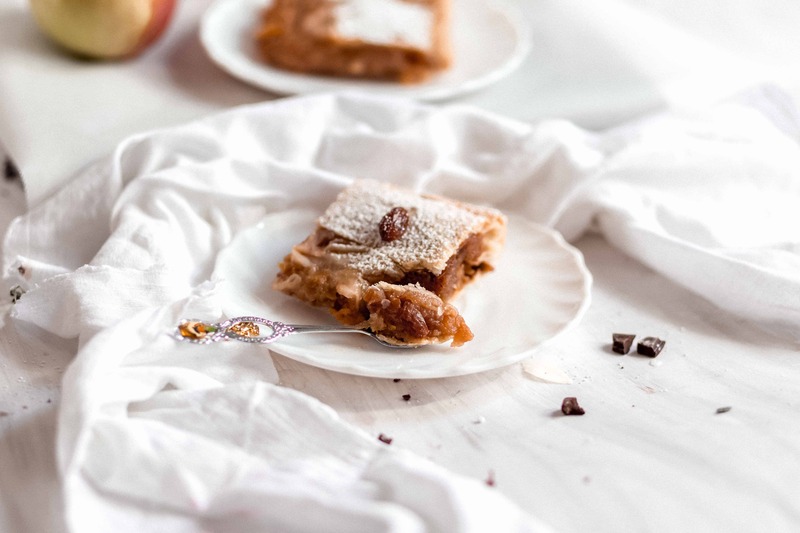 The raisins, though controversial, hugely elevate the taste of this vegan apple strudel. I wholeheartedly recommend you to chuck a bag into your mixture even if you’re not a huge fan yourself. 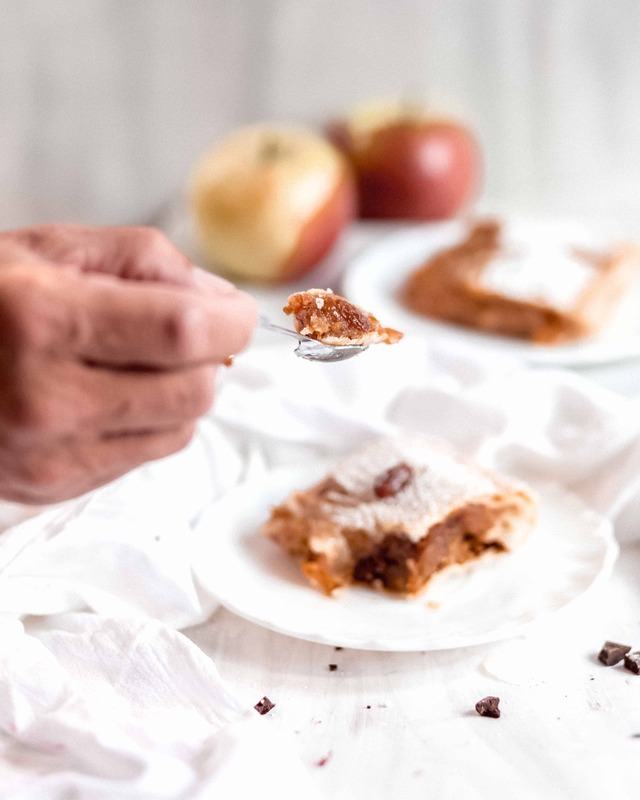 Whether you remember it from your childhood or have never tried out a strudel before, make sure to give this vegan apple strudel a go! Coarsely shred your apples and drizzle with rum. Arrange the grated apples to cover two-thirds of your puff pastry (lengthwise). Leave one third to be able to roll the pastry easily later. Add the vanilla extract, sugar, breadcrumbs, raisins and cinnamon. Rub the pastry edges together to seal it and prevent the mixture from leaking. 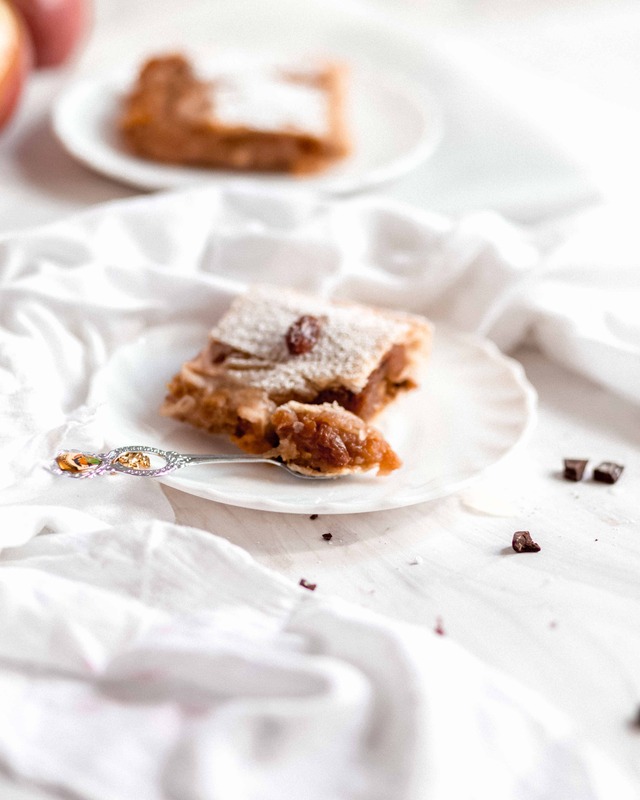 Place your pastry on a baking tray (use baking paper to prevent it from sticking). Bake at 180°C) for 60 minutes. Cut into approximately 16 pieces, dust with powdered sugar and serve fresh. Make sure to choose VEGAN sugar!